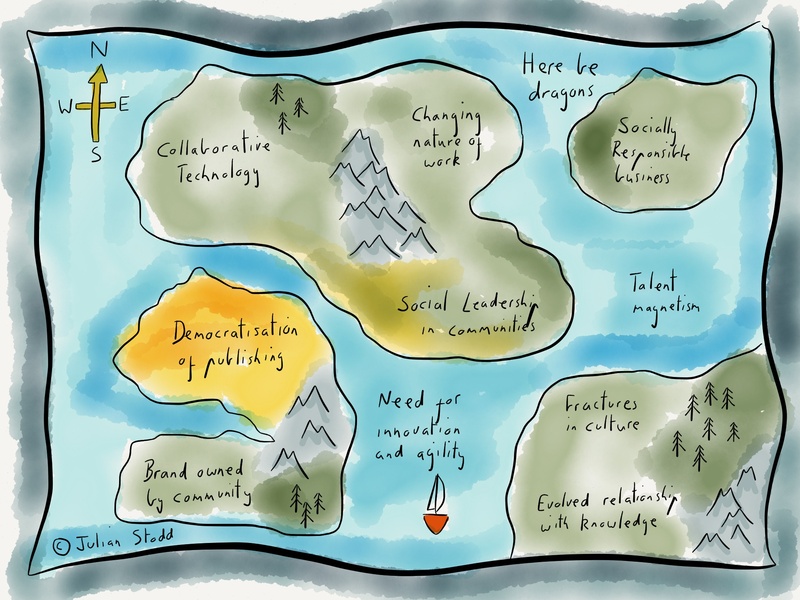 As i work on the book about the Social Age, i’ve spent some time charting the ecosystem of change. Change is constant, and not just in one area. Driven by technology, in a context of wider social change, everything is in flux. Social technology has facilitated enhanced communication: barriers of time and geography are removed, enabling us to develop and maintain wider communities of loose social ties (as well as deeper, stronger ties with certain people over wider geographies). This drives community formation and function: stronger, wider, deeper. We can view technology as a driving and facilitating force, but it’s matched by evolved social skills, particularly driven by social networking. We have learnt through Facebook and it’s ilk to live in online communities, developing curatorial and publishing skills to thrive in these spaces. Publishing is an evolved artform too: with every device of consumption being a device of production (as Clay Shirky taught us) publishing is democratised through multitudinous software solutions. From WordPress to Twitter and Facebook, Yammer and LinkedIn (and a million others) we can share easily. We can produce videos, animation, music, photos, any creative and collaborative venture with ease. So collaborative technology and democratisation of publishing power change. The nature of work changes too: away from careers towards portfolios: agility being key. You’re unlikely to stay in one place for long, either through choice or redundancy. This brings about a change to the underlying social contract, as well as different ownership of ‘career‘ and ‘development‘. We now own our own agenda. Organisations and individuals need to adapt to this view: transferable skills and abilities as well as the ever present support we feel from communities. For organisations, the shift includes a move where brand is owned substantially by community: the older model of advertising was one way. Pay enough and you can push your message to everyone. Today, everyone pushes back and has a loud voice to go with it. But it’s not all bad news for organisations: as they increasingly want to operate in socially responsible ways, the Social Age brings them the tools and capabilities to do so. Sustainable, agile, fair. Culture is important in any map of change in the Social Age: i’ve been exploring how cultures form and respond to change, working on a model of slow degradation followed by fracture. It’s about alignment of core values and outward behaviours: what does it cost you to be in a culture? Finally (at least in this brief list!) is our evolved relationship with knowledge: as we recognise the true impacts of the reputation economy, what you know is less important than what you can do with it, your ability to create meaning. To navigate the Social Age, we need certain skills: social leadership, collaboration, curation, storytelling, humility, sharing. It’s a long list, but success comes through proper planning. And none of it is rocket science: it’s about understanding the environment and ensuring we remain agile as we navigate it. This entry was posted in Agile, Change and tagged Chart, collaborative technology, Exploration, Facebook, Leadership, Map, Mapping, Social Age, social change, Social Leadership, social networking, Social Technology, Socially Responsible Business, Technology, Twitter, Yammer. Bookmark the permalink.